After my son died, I felt intuitively that he was still with me, would always be with me. But that sense was overshadowed by his absence, the sense of loss. The deeper sense of our enduring bond would take years to develop, through persistence and faith. Chris was there, but in order to sustain that sense from where I stood, I had to become an active partner. I had to cultivate it, to keep coming back to it, to believe in it. Most especially, I had to learn to let him go. Keeping Chris alive occurred through many and often wondrous ways, which crisscrossed and ultimately formed a cohesive whole. Today there is deep gratitude, knowing that through God’s grace we never lose who we love. From the beginning, there were simply ways of experiencing Chris without any thought or effort. He had been a lover of the natural world, and I felt him in the wind, the brilliance of autumn, rainbows, and crimson skies, knowing his spirit could be many things. I spoke to him each day, telling him how much I loved him and how proud I was that he had become one of God’s own. I would look to him for guidance and pour out my feelings. Chris comforted me daily in my sorrow, whispering, Mom, I am with you always. I recorded memories of Chris, vignettes about growing up, and collected stories from friends, traveling to places where he had lived. Through the hearts of others, Chris came to life in ways I could not have known him otherwise, enriching my own memories. Our collective tales formed a kaleidoscope of perceptions, capturing his essence. Though it felt wonderful to connect with Chris’s spirit, I could not have sustained it without letting him go as I had known him. I would have kept drifting back to the sense of loss as the dominant, tangible reality. It wasn’t a given that I could let him go—having raised him from infancy. You revel in the aliveness of your child and the miracle of his being. Releasing Chris, accepting his death, came in many guises over many years, in little steps and with frequent backsliding. Letting Chris go meant the willingness to live again. To dance again, run with the wind, embrace hopes and dreams—when Chris could not. It meant admitting I still belonged to Earth, with more to learn and more to give. It meant risking our bond, for in reclaiming my life, I feared his spirit disappearing, when all would be lost. For the first anniversary of Chris death, I journeyed to Yosemite, the place that had claimed his life. On the anniversary day, I hiked Half Dome, circling the 4000 foot giant by trail. Standing high up in the elements, in the deep ethereal blue, surrounded by the granite wonders Chris had so loved, I scattered his ashes, releasing him to God. The ways of keeping Chris’s spirit alive are with me still. I share my visions and the news of the day. He quips clear, humorous one-liners, as he did in life. I see the calm, smiling nature shining through memory. I see him in the serendipitous way of things and in exquisite cloud formations. I feel the joyous giving and receiving of our love. Meanwhile, I keep letting go, stepping back towards life. God never takes without giving back a hundredfold. 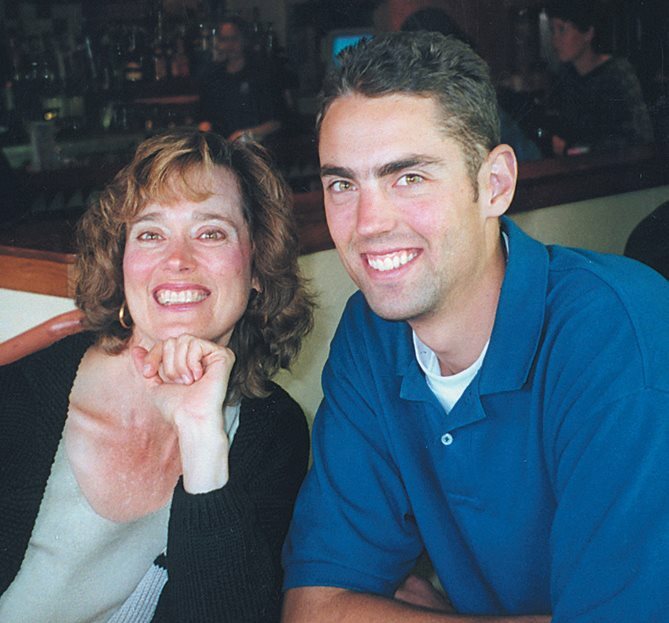 Ten years after Chris’s passing, our love burns eternal—a beam of light, becoming ever more golden. After my son died while rock climbing in Yosemite National Park, May 2003, I ventured into his world. I wanted to understand why climbing had been the heart of his life. Why would he have done something so risky that it could take him from us forever, especially since he knew I loved him so? Looking back on the time of grieving the loss of my son, I feel gratitude for the experience. There will always be times of sadness, but the gains are immeasurable. On the first day of knowing my son was gone forever, when I took to my bed with a broken heart, certain truths rose from within: Only good can come from love. Chris will be with me always. There is meaning and purpose behind his death. In the months that followed, I held onto the insights of that first day. They became my guide, my faith, my eventual resurrection. Grief, in those first unbearable months would come in waves. In moments of relief, I could feel Chris’s loving presence. He didn’t exist in our time anymore, but as a spirit in eternal time. Though I didn’t know if that sense could last, it was a revelation—the saving grace. I learned that my two states of awareness, that of Chris’s absence and his presence, could not exist side by side, but only in succession. Surrendering wholeheartedly to the pain of loss, allowing it passage, opened a door into God’s realm. Though I’ve kept up this blog for a while now, I feel led to bring you all into me – into my life and my story. I’ve recently published a book titled Freedom to Fall, which chronicles my journey to healing after losing my son Chris. This is me. I am beginning work to publicize the book and share my story with whomever will find it. Here’s to new beginnings. Born and raised in Louisiana, I followed my heart to Colorado, where I attended the University of Colorado and pursued a career in Special Education. After marrying and moving to the mountains to raise a family, I discovered a calling as a storyteller, performing original stories as well as myths and legend from world cultures. Ultimately, I divorced, and after my two children left home, I made my way down the mountains, landing in Denver around the turn of the century. Then in 2003, something happened that changed my life. In May of that year my daughter, Kate, who was in college, had come home for the summer. Chris was rock climbing in Yosemite National Park. On June 1 we were awakened in the night with the news that Chris had been in climbing accident and was dead. The devastation and shock of that summer was soothed by the presence of my daughter and by an abiding faith. I knew intuitively that Chris was still with me and always would be. I felt there was meaning behind his passing. I wrote every day about the raw emotion of grief coupled with whatever insights came. Those journal notes became the basis for Freedom to Fall, which I began that autumn. The book chronicles my journey through the first two years of grieving, along with a portrayal of my son in a way that captures his spirit. Just as all people have special qualities and gifts, I felt that Chris, for his 25 years of living, had much to offer in the way he loved life. The hard times of those first two years were also times of hope and redemption. I discovered the healing power of love. I did not think that my life was over. I knew that I would fully live again, and through that belief, found my way. Writing the book was cathartic, and the blessing was in realizing that the book could be an inspiration and comfort to others. Today, ten years after Chris’s death, I am standing on solid ground. Of course I miss my son, but we have a relationship that endures. He is my angel in Heaven. I choose to write a blog to communicate with like-minded people. In these times when families are often spread out and neighbors may be strangers, I can’t think of a more uplifting way to establish community than through the simply act of sharing stories and ideas through writing. I write first thing every morning; it is the mainstay of my life, and I look forward to making connections.